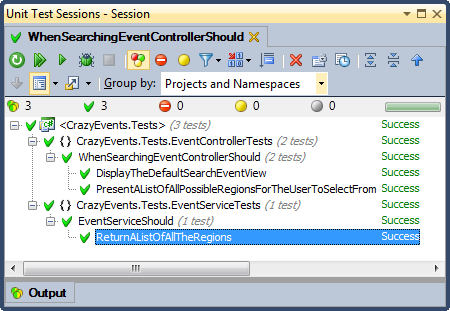 In Part 4 of the series we implemented the first controller action of for the Event Controller in a Test Driven manner. As we are working from the outside-in it means that although the Controller action has been implemented, the layers beneath the Controller (the service layer and the repository in our case) are not yet implemented beyond creating anything needed by the layers above. As the controller needed to call the service it was implemented in part 4, but is far from complete. The next step in the outside-in process is to build up the implementation of the service method guided by tests. The functionality for this service method is really simple so it shouldn’t take long to get it up and running. First we should Create a new Test Class to hold out service tests. I have separated out the service test into a separate namespace to aid navigation and readability of the test. I have also named the test class in such a way that when read in conjunction with the test name it gives a meaningful description of the intent of the test. So what is the intent of the test for the GetAllRegions() service method? We would expect the service method to get all the regions so that they can be presented to the user in by the Event Controller. In this example we are going to have a repositories for data persistence. So this method is going to simply ask the repository for a list of regions, and then package them up to be returned to the Controller. Lets write the test. The Repository should always work with domain entities, and ours is no exception. Next up is the Region domain entity. Again I have created a new project to hold the domain items. And finally the service method implementation. This method has no logic, as we simply want to return all the regions. The only thing we need to do is to to take the regions returned from the repository and build the DTO’s for the Controller. Now the implementation is complete lets run the tests and make sure everything is okay. All the tests are green which means that everything is going well. The implementation for the scenario is almost complete. Working from the outside in means that the only thing left to do at this point is the repository implementation. As the repository will need to perform the data persistence (usually by talking to a database) it is not possible to isolate the implementation for unit testing in the same way as the controller or the service and is not generally part of an outside-in TDD approach. That is not to say it should not be tested. It would be prudent to create an integration test for the scenario including talking to a real database. Better yet, would be to use the scenario to create a BDD style test with a framework such as SpecFlow. Once the repository method is complete, it is time to move onto the next slice of functionality and follow the same outside-in process. This series of posts will talk about Windows Communication Foundation, starting with an introduction into the technology and how to use it in you project, moving onto more advanced topics such as using an IOC container to satisfy dependencies in your services. In the previous post we looked at how it was possible to use ChannelFactory to consume a WCF service from an MVC controller without using a proxy generated from the service WSDL. This approach is less than ideal. The ChannelFactory creation is a little awkward and would be littered throughout the controller code creating duplication. If we tried to run this MVC would not be able to create the controller as there is no longer a parameterless constructor. Since version 3 MVC has introduced a mechanism for using IoC dependency resolution to resolve Controller dependencies through IDependencyResolver. Simply implement the interface and register using DependencyResolver.SetResolver. If your needs are simple, then there are very simple implementations that will serve you well, however if you want to resolve dependencies that implement IDisposable then you need to be a bit more careful, as simple implementations often do not cater for IDisposable at all. I am going to recommend a NuGet package to save us from implementing IDependencyResolver as I want to focus on how we can resolve WCF service dependencies. Unity.MVC3 is a nice little package that makes setting up Unity with MVC very easy. Although it was built for MVC3, version 4 uses the same mechanism and the package continues to function in the correct manner. You can read more about how the package functions here. So what does this actually do? The first parameter is the type of lifetime manager we require. A Unity lifetime manager describes how dependencies are created and destroyed and the lifetime those dependencies have. In this case a ContainerControlledLifeTimeManager means that the same instance is returned for each call (also known as Singleton instance). This is desirable for creating WCF channels as it is a comparatively expensive operation so we only want to create the channel once for the lifetime of the Unity container. There are several other Unity Lifetime Managers that are useful in different circumstances. The next parameter introduces a factory function that tells Unity how to create the required concrete type. In our case we are going to create a new WCF Channel using ChannelFactory for the named client endpoint we set up in the web.config. The only thing we need to do is to call Bootstrapper.Initialise() from Application_Start() in Global.asax and we are good to go. The controller is now completely decoupled from the WCF ChannelFactory, leaving a much cleaner implementation. In An Introduction to WCF I talked a little about what WCF is and how it can be used, as well as creating a simple WCF service. In this post I want talk about how to consume WCF services in the most common situations. There are two common scenarios when consuming WCF services; consuming a WCF service from a non WCF client via a proxy, and consuming a WCF service from a WCF client via a shared contract with ChannelFactory. A service proxy acts as an interface between the client and the service. It means that the client does not need to know anything about the implementation of the service other than the operations that are exposed. A downside to using a proxy is that if the interface of the service changes then the proxy will need to be regenerated. Using a service proxy will be necessary if you do not control the service you wish to consume. To add a service proxy you can either use svcutil.exe or let Visual Studio generate the proxies for you (which uses svcutil.exe underneath) by right clicking on a project and selecting Add Service Reference. I don’t really want to dwell on service proxies too much, as there is lots of information available already and it is not really very interesting. There is another way to consume a WCF service if you have more control over the service and are using WCF services to provide some separation of concerns in your application. A real world example is probably the easiest way to describe the type of situation in which this approach is useful. Lets say I am creating an ASP.Net MVC application and I want to have some separation in the layers. Along side the MVC client I want to have a repository to take care of the persistence side of things and a service layer to take care of the business logic so that I can call a service method in the Controller of the client that will perform some operation and maybe talk to the repositories. It is of course possible to have the services in-process, and for a small application it may be a sensible solution. When moving to a larger application it may be prudent make the service layer true services that can be deployed on a separate server (or server farm) to aid scalability and security. WCF is a ideal technology for these services. In this instance the WCF services are only to be used by this particular application and so we can use some more WCF functionality to remove the need to keep generating service proxies. You will definitely appreciate this as you develop your application. Regenerating proxies gets a little tiresome after the hundredth time. To use ChannelFactory it is necessary that both client and service host share the same operation and data contracts. Usually this means that the service interfaces (operation contracts) and data contracts are separated into separate assemblies so they can be shared between projects. According to MSDN it is “A factory that creates channels of different types that are used by clients to send messages to variously configured service endpoints”. WCF uses a Channel Model layered communication stack to communicate between endpoints. As with other stacks such as TCP/IP the Channel stack provides an abstraction of the communication between the corresponding layer for the sending and receiving stack. The stack provides an abstraction for how the message is delivered, the protocol to be used and other features such as reliability and security. Messages flow through the Channel stack and are transformed by a particular Channel, for example the transport channel transforms the message into the required communication format. Above that the protocol channels might encrypt the message or add headers. It is the ChannelFactory that is used to create the channel stack for a particular binding. For more information on the Channel Model see this MSDN article. In the previous post I created a simple Product service with a single operation. I am going to extend that example to add an MVC client that uses ChannelFactory to consume the service. I will break the process into a number of steps to make it easy to follow. I have moved the service interface and the data contracts into separate assemblies so they can be shared with the client. As mentioned briefly in the previous post, the data contracts would usually be Data Transfer Objects and not domain entities. For this example I have used domain entities an data contracts for ease. I have also added an Asp.Net MVC 4 project that will act as the client and consume the WCF service. Just as we added some configuration to the Web.config of the service project to let WCF know how we want the service to work, we also need to add some similar configuration to the client Web.config. We can once again see the ABC of WCF. The address is the URL of the service which I have set this to the URL of the Service when it is running0 from Visual Studio. When the client is deployed the address needs to be changed accordingly. The binding needs to be the same as the binding of the service you want to consume. The contract is the service contract from the shared assembly. Finally a name is used so ChannelFactory can get the configuration details by name. Firstly, create a new factory for the service contract required. The constructor takes the name of an endpoint from the configuration. A channel is then created based on the service contract and the named endpoint configuration. It is then possible to call an operation on the channel and return some results. I have then used the results in the model for the view. As you can see from the above example, using ChannelFactory is a very easy way of calling a service when you have access to the service and data contracts. However if you were calling multiple services from a controller it would be better to get some reuse and not have to keep creating the factory and channel over and over again. It is possible to create a helper method to control the creation and use of factories but there is a better way. You are probably already using Dependency Injection in your application via an Inversion of Control container such as Castle Windsor or Unity. It turns out that is it very easy to inject dependencies into service and also to inject a channel directly to where it is needed in your application. In the next post I will look at injecting dependencies into the service implementation.